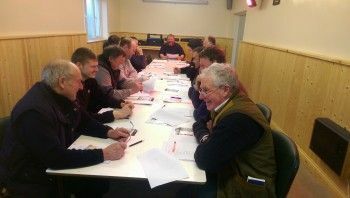 Farmers from the rural parish of Bewcastle are now able to comply with the latest agricultural spraying legislation after attending a course that was supported by the Bewcastle Fund. The Bewcastle Committee, which is run by local people from the Parish Council, school and local church, were awarded £3,000 to subsidise the costs of a chemical spraying course, which is now mandatory for all farmers. The Committee sourced a suitable tutor to run the course and were able to offer the training to farmers at a discounted rate. 36 farmers attended the course which was delivered in Bewcastle Community Hall. This meant farmers did not have to struggle to find time in their busy lifestyles and lose income travelling 35 miles to the nearest agricultural college to complete the training. The Community Hall also benefitted, as they were able to generate additional income towards the general upkeep of the Hall. Located 3 miles from the border of Scotland, Bewcastle is the largest parish in England, but also the least populated. The electoral roll shows there are only around 330 people living in the area. Bewcastle was the last place in England to get piped water in 1937 and electricity in 1964. The internet and mobile signal is very poor. Although rurally isolated, the parish is steeped in history with remains of Roman roads, forts and settlements. St Cuthbert’s churchyard is home to the famous Bewcastle Cross which dates back to the seventh century and features the earliest recorded sun dial. The Bewcastle Fund was set up by an anonymous donor to help people living in this rural community. The fund primarily supports people working in the agricultural industry.